Because I spend my days working with beautiful food and talking non-stop about beautiful food with people who are all passionate about cooking in both their professional and personal lives (it’s a challenge, indeed) I sometimes find myself at home at the end of the day in need of sustenance but strongly averse to the idea of remaining in the kitchen any longer than necessary. During such times I am presented with two options, the first being takeout and the second being a recipe that is kitchen efficient. I almost always opt for latter because at this point I’m usually in my nightgown and slippers and there’s absolutely no way I’m going to change into something publicly presentable when I can make something tastier in the same time it would take to go out for food. I am an enduring fan of this salmon and rice combination, for sheer speed as well as ease of preparation. The salmon can begin marinating in the morning but will also be equally delicious if made right before baking and there is no real chopping besides the orange slices and fresh herbs (which you could cut with scissors if so inclined.) If you have a rice cooker this meal becomes even simpler but can certainly be made on the stove without any issue. The citrus used too, is flexible and you can substitute any type you happen to have on hand. Eat this sunset hued salmon and brightly flavoured rice in your pyjamas with the book of your choice and a glass of ice cold lemonade or something white and chilled. 1. In a small bowl whisk together the orange juice, garlic chili paste, olive oil, and orange zest. Pour over the salmon fillets in a glass baking dish. Refrigerate and marinate the salmon for up to 12 hours in the fridge or bake right away. 2. Either bake the salmon at a lower temperature for a longer time (275 degrees for 25-30 minutes) or bake at a higher temperature for a shorter amount of time (400 degrees for 10-15 minutes.) In all honestly I find that the lower temperature gives the salmon a more buttery texture but I sometimes err on the side of speed and the results are still very satisfying. 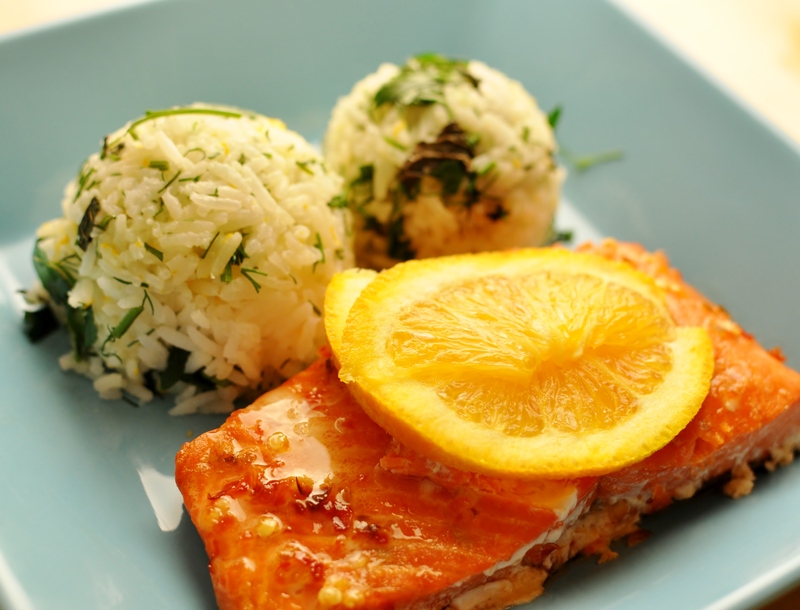 the salmon is done when light pink and flaky in texture. 1. While the salmon is baking cook the rice in either a rice cooker or on the stovetop in 1 1/2 cups of water and 1/2 cup of orange juice.) Once cooked turn off the heat and stir in the butter, herbs, zest, and salt. Serve hot alongside the salmon and enjoy your well-earned victory over takeout. When I first heard this song Dan Snaith was using the moniker Manitoba but is now using the name Caribou (and Daphne.) Ian first put this song on a mix CD he made for me almost 10 years ago and I remember how struck I was by this song and how light and exhilarated it sounded, like real joy set to music. Until this point I’d never seen the video and it visually is somehow exactly as it should be; weirdness and light colliding to form 3 minutes of happiness. In many ways this is the perfect recipe for last minute meals. Made with odds and ends you may have floating around in your fridge it comes together quickly and is endlessly adaptable. For the rice you can sub in brown rice, purple rice, quinoa, orzo or bulghur, it just needs to result in about 3 cups cooked. Other things that are good include steamed broccoli, spinach, corn, crumbled feta, sundried tomatoes, dry fried tofu, chipotle peppers, etc., etc. 2. In a large skillet saute the peppers, garlic and scallions until soft. Add the beans, cooked rice and salsa and stir to combine. 3. 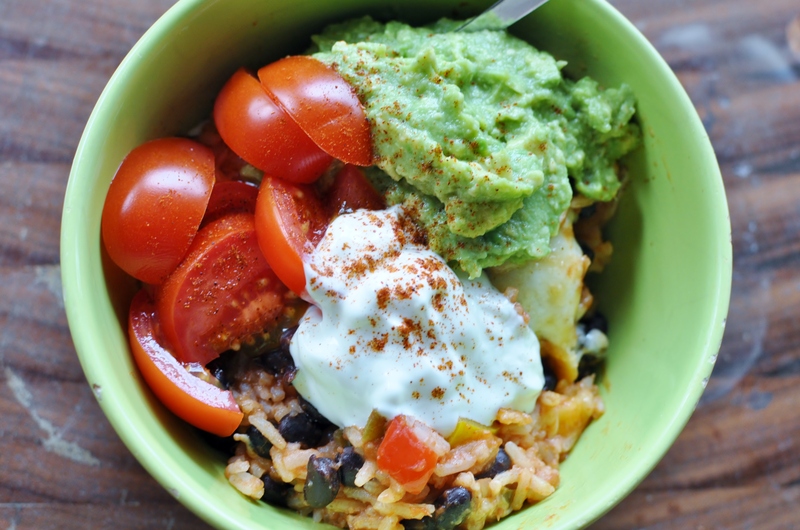 Put the rice and bean mixture into a casserole dish and cover with the grated cheese. Bake for 20 minutes or until the cheese on top has browned. It’s been an Echo & the Bunnymen sort of week; I’ve been listening to them at work, at friend’s houses and while making lunch on a holiday Monday. Nothing says “Happy Birthday Queen Victoria!” like some heartfelt gloomy pop on a grey afternoon in May.